On Thursday, February 7, 2019, the House Communications Subcommittee held a hearing, “Preserving an Open Internet for Consumers, Small Businesses, and Free Speech,” another conversation on net neutrality and an opportunity for lawmakers to spend three hours claiming they support an open internet, while rehashing old, partisan debates and making little progress towards a legislative solution. As we saw at the hearing, GOP lawmakers presented themselves as advocates for the concept of the "open Internet," while simultaneously attacking the [Federal Communications Commission's] 2015 Open Internet Order, the only open Internet rules that have survived court review. Their argument, interestingly, echoes the language used by large ISPs like Comcast, Verizon, and AT&T: we’re for an open internet, but we oppose Title II. Yes, on Thursday, both Democratic and Republican representatives expressed support for legislation that would prevent blocking, throttling, and (anti-competitive) paid-prioritization. But they also squabbled over key disagreements: Did net neutrality rules decrease investment in broadband networks? Can we have enforceable net neutrality rules without Title II protections? What should actually be included in net neutrality legislation? While we wait on the courts to decide the fate of the FCC's 2017 repeal of net neutrality protections, we are left wondering: How can internet users be protected from net neutrality violations until we have that legislation? Where Is the Net Neutrality Debate? The hearing was the first for the subcommittee since the 2018 midterm elections and the first under new Subcommittee Chairman Mike Doyle (D-PA). It came less than a week after the FCC defended its repeal of net neutrality rules before the U.S. Court of Appeals for the D.C. Circuit. As John Eggerton wrote, the subcommittee “weighed back into the still legally muddy net neutrality waters.” With oral arguments delivered, we might expect the court to hand down its decision sometime this summer. The decision might add some clarity to the path ahead for net neutrality, but it is unlikely to end the debate. If you want a primer on net neutrality, including an explanation as to what "Title II" means, see Benton cardstack on Net Neutrality. Mozilla Chief Operating Officer Denelle Dixon testified, representing the not-for-profit maker of the open-source Firerfox web browser -- and one of the lead plaintiffs challenging the net neutrality repeal. She noted that the current internet climate makes net neutrality protections needed more than ever before. "It seems like every day the news presents us with a new story of some abuse of our trust online by a major tech company. Yet these very same big companies are the best positioned to buy fast lanes in a future non-neutral internet. The entrepreneurs, small businesses, and independent voices will be the ones left behind." Her solution is to restore the protections of the 2015 order through litigation, with adequate and flexible authority for the FCC to enforce. Actress and writer Ruth Livier testified about the impact of net neutrality on her career in the entertainment business. “Net neutrality is about ensuring that traditional media’s exclusionary practices are not transferred and amplified by broadband providers. It is about who has the power to control narratives and thus shape perceptions and perspectives." “A few powerful internet service providers should not be entitled to mediate our voices, to frame discourses in order to serve their interests, nor to decide who or what is 'worthy' of being visible or invisible in our society, and under what conditions,” she said. Joseph Franell, CEO of Eastern Oregon Telecom, a telephone and broadband provider in Northeast Oregon, said the application of Title II as part of net neutrality had a dramatic chilling effect on rural telecom in the Pacific Northwest and suspects the same could be said about the rest of the country. He felt that Title II does not have to be, nor should it be, part of the solution to the problem of bad behavior by a few internet service providers. He argued in favor of carriers being able to prioritize internet traffic. "Prioritization of traffic becomes a problem only when it is anti-competitive in nature when it is done to harm/eliminate the competition," he said. "And, there are consumer protection laws in place that target this type of behavior. Adding additional layers of regulatory burden is not the answer." He also noted that ill-informed public furor and fear surrounding the net neutrality debate precluded any objective discussion of the topic. And that this resulted in distrust of and anger toward ISPs, like his company, that had never manipulated their networks' traffic in an anti-competitive nature. She highlighted the various data-discriminatory practices, as well as the false claims told by the Ajit Pai-FCC about broadband investment before and after Title II. 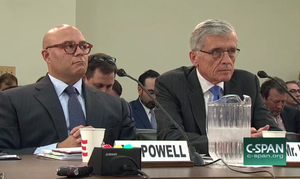 Former-FCC Chairman Michael Powell, now President and CEO of cable industry lobby NCTA - The Internet & Television Association, also testified. Since 2004, when I outlined the four internet freedoms while serving as the FCC Chairman, we have found common ground around the basic tenets of net neutrality rules: There should be no blocking or throttling of lawful content. There should be no paid prioritization that creates fast lanes and slow lanes, absent public benefit. And, there should be transparency to consumers over network practices. Working in good faith, we could easily write effective code to protect an open internet. So, what is the problem? To Powell? Ambiguous FCC authority. A software infinite loop is caused by a programming error where the conditions of exit are written incorrectly. The bug that is responsible for the net neutrality endless loop is ambiguous legal authority. The FCC has struggled to adopt sustainable rules because it lacks a clear basis of jurisdiction on which to moor net neutrality rules that would apply to internet service providers. Figuring out what the rules should be has not been the problem. Rather, the problem for the Agency has been how to adopt appropriately targeted rules in the absence of clear congressional direction. If authority is the problem, congressional action is the answer. Powell pointed to Congress to rewrite the code and end the loop. "The country sorely needs Congress to break this interminable circularity. That is why we support bipartisan legislation to enshrine core net neutrality safeguards without sacrificing the flexibility needed for all market participants to retain incentives to invest, innovate, and prosper." Net neutrality is not a new concept, dating back to English common law, and has been the organizing policy principle to protect against the abuse of gateway services. The 2015 Open Internet Order extended those principles to the most important network of the 21st century with the flexibility necessary to assure continued relevance as technology evolves. The Trump FCC not only repudiated those principles but also washed its hands of oversight of this essential network, transferring such responsibility to the Federal Trade Commission, despite its much more limited powers. Key Disagreement #1: Did Net Neutrality Decrease Investment in Broadband Expansion? Witnesses disagreed in their testimony as to whether net neutrality rules, or the repeal, have had significant impacts on investment in broadband networks. Powell trumpeted the dubious statements made by current-FCC Chairman Ajit Pai. "[I]n the short two years in which Title II was in place, we saw the depressing effects on the market of such a distorted regulatory overhang— innovation slowed as ISPs and edge providers delayed or abandoned new service offerings, and the pace of investment in broadband networks demonstrably slipped." He continued later, "By contrast, in the wake of removing Title II, we have seen a burst of energy flowing into network innovation and investment." Franell agreed, though chose to only speak from his company's perspective. In response to questions from Rep. Gus Bilirakis (R-FL), Franell said that anything that makes things more complex, that slows his company down (meaning more filings due to regulations), adds a layer of uncertainty. He said he would prefer to see a national standard, a “light-touch” approach, and not Title II. He acknowledged the discrepancies on broadband investment numbers, saying he read the USTelecom report on investment, which tells a different story than what he was getting from people at the hearing. But he said only when there was commitment from the Pai FCC to repeal Title II did he start to see cash investment opportunities open up. After the repeal, he got offers from equity investors, which had a dramatic impact. No matter which of those periods we examine, one thing is clear: individual broadband providers’ capital expenditures have not uniformly skyrocketed since the FCC’s repeal of Net Neutrality rules in December 2017, even coupled (as that repeal unfortunately was) with massive corporate tax cuts and giveaways made law that same month by the 115th Congress and the Trump White House. In fact, many of the largest ISPs have now reported to investors that their capital expenditures fell in 2018, decreasing year-over-year from 2017 – the last full year before the Pai repeal and the Trump tax cuts were both voted on and approved. Rep. Peter Welch (D-VT) was among the many lawmakers who discussed the discrepancy in investment numbers. He cited a Financial Times article that said the big four U.S. broadband companies invested less in capital projects last year than they did in 2017. Powell responded by saying “The headlines in those reports are wrong.” He said capital expenditures (CapEx) "in net" say more than just networks. He attributed the reduction in CapEx to a reduction in video content investment and claimed there has been an increase in network investment. Rep. Ben Ray Luján (D-NM) questioned FCC Chairman Pai’s assertion that the existing rules would increase investment, expand internet access, and benefit his poorest constituents. “It’s just not true!” he shouted. He said that forthcoming laws should be explicit about how they help these communities. Key Disagreement #2: Can We Have Enforceable Net Neutrality Rules Without Title II Protections? Many of the questions from lawmakers were addressed to the former FCC chairmen. And for good reason: they are on different sides of the Title II debate. Powell said that Title II should be a nonstarter in any bipartisan solution, while Wheeler said that his 2015 Title II-based order should be the starting point. Wheeler said that claiming to be for an open internet but not Title II was like saying one was for justice, just not the courts that enforce them. Wheeler provided a helpful breakdown of the Title II debate in response to questions from Rep. Tom O’Halleran (D-AZ), by noting that we have to agree on what Title II means. To Powell, Wheeler stated, Title II is a list of awfuls. To González, it’s a list of positives. Wheeler noted that his view might be unique because when he was running the wireless industry association, the industry demanded that the FCC designate wireless carriers as common carriers -- they needed uniformity of rules. And so it came to be as the rules were modified with forbearance. And the wireless industry invested hundreds of billions on the basis of being a common carrier under Title II and having that kind of certainty which the industry sought. Wheeler summed up: the key driving force is how do we have a national set of rules, and how does it adhere to the concepts and protections under Title II. But Powell offered a rebuttal: He made lawmakers aware that Congress was effective in setting those parameters. Furthermore, while wireless telephone service fell under those parameters, wireless broadband service did not. He concluded by saying Title II is not a “competition empowering regime,” but rather, a regime favored by monopolists. But there’s more to the debate. For Wheeler and others, just “Bright-Line Rules” (No blocking, throttling, or (certain) paid-prioritization) may not be sufficient, because they would not necessarily provide the clear authority to enforce the rules and prevent future abuses. A key question for Wheeler is: how do you maintain an open internet for tomorrow? Dixon agreed. When asked by Chairman Doyle whether bright line rules were enough, she replied in the negative. She noted that there are loopholes, that governance is important in this area, and that we cannot rely on the FTC. Wheeler concurred with Nixon’s assessment in response to questions from Rep. Dave Loebsack (D-IA). Wheeler said if ISPs know that if blocking, throttling, or paid-prioritization are off limits, it still means everything else done to advantage themselves can be done. And that brings us to the “paid-prioritization” debate. Powell claimed—falsely, according to Wheeler—that a ban on paid-prioritization could prevent prioritization of public safety services. "When I was chairman, I was a huge champion of public safety, and I think it's a perfect example of why we should be careful about what we mean by 'no prioritization,'" Powell said. "There are societal uses that we will all agree should enjoy a higher priority over other uses." Wheeler responded to Powell, saying, "there's just one thing you left out... prioritization of public safety activities was specifically allowed for under the 2015 rules." The Pai-led FCC's repeal of those rules allows ISPs to throttle data services and deprives consumers of an agency to lodge complaints with, Wheeler said. "It's not just the firefighters and policemen who are affected by the lack of an open Internet," Wheeler said. "It's also the people who are the victims of those emergencies who themselves need to get online and are experiencing the same blocking or throttling realities and, as a result of the decision by the FCC, have nowhere to go." And then there's the argument of Title II being "old" and not-suited for today's times. Republican Representatives displayed old telephones as props, presumably to add a visual to the argument. Rep. Billy Long (R-MO) had people identify huge photos of recent House Speakers and then brought up Thomas Rainey, the Speaker from 1934. “Even Speaker Rainey would admit that a bill he passed should not be governing this century’s internet,” Long ventured. Thankfully, for the sake of everyone's sanity, Rep. Anna Eshoo (D-CA) called out the absuridy of the argument. “A lot of references have been made to old laws. Title II has just been beaten to a pulp. You know what the oldest one is? The Constitution. That’s got so much dust on it, maybe we should throw that one out, too,” she joked. Eshoo asked about what aspects of Title II are we opposed to. She didn't think Title II contained menacing things and believed they’re worth fighting for. Values like privacy. “Everyone says that they love the internet, how important it is,” Rep. Eshoo said. “Where were so many people two years ago, when ripping privacy off the internet went through here like a bolt of lightning?” she asked, referring to the reversal of the FCC's Broadband Privacy Rule just after the 2016 election, a move widely decried by privacy advocates. Key Disagreement #3: What Should We Actually See In Net Neutrality Legislation? Dixon: Flexibility for enforcement. Most important thing is a cop on the beat. Livier: Folks need to be held accountable with repercussion for unfair play. González : Legislation that adopts full protection of 2015 order. Frenell: All pieces of the internet be treated equally. Powell: Endorse four freedoms with sufficient flexibility to address unknown situations in the future. Wheeler: A referee on the field with the ability to throw the flag for unjust and unreasonable activity. Legislation intended to be introduced from Rep. Cathy McMorris-Rodgers (R-WA) modelled after Washington state’s 2018 net neutrality law. I have introduced the offer I made in 2015, which codifies the FCC’s protections, so they aren’t subject to changing administrations. The bill prohibits blocking, throttling, and paid prioritization, and requires that ISPs be transparent in their network management practices and prices. If my colleagues don’t agree this is the right starting point, my friend Mr. Latta has introduced legislation drawn directly from [Former Rep. Henry Waxman (D-CA)’s] proposal from 2010 that he also filed with the FCC as then-FCC Chairman Genachowski was drawing up the 2010 order. My colleague Ms. Rodgers has a bill that will give you the Washington state net neutrality rules from 2018. It is important to point out that Washington State has a bicameral legislature in which Democrats control both houses, as well as a Democrat Governor who also happens to be a former member of this committee. Will any of these proposals gain bipartisan support? “It’s got to have strong provisions in it and if we can work towards that end, then anything is possible,” said Chairman Doyle after the hearing. Many net neutrality advocacy groups came out against the bills. “All three of the lawmakers behind these bills essentially rubber stamped Ajit Pai’s repeal of net neutrality; that should tell you everything you need to know about their true intentions,” said Fight for the Future’s Evan Greer. And in announcing the hearing, Chairman Pallone said: “It’s going to be quickly followed after a couple hearings with legislation that would repeal the repeal." Net neutrality's immediate future rests in the courts. But a long-term solution seems to rest in the legislature. At the start of the hearing, we knew lawmakers wanted a bipartisan legislative solution to ensure an open internet. And we knew they disagreed about how to get there. Now? Much of the same. And then there's the question of whether President Donald Trump would sign any such piece of legislation. “Until strong open internet protections are enacted, our only hope is the millions of Americans who are fed up will hold Congress accountable for passing strong net neutrality laws,” said Chairman Pallone. So here we are, many, many years into the net neutrality debate. With many chapters yet to be written.